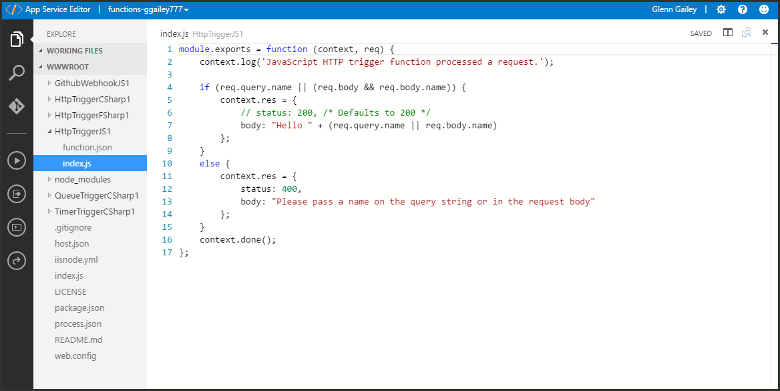 Azure Functions では、関数アプリに個々の関数の実行コンテキストが用意されています。In Azure Functions, a function app provides the execution context for your individual functions. 関数アプリの動作は、特定の関数アプリによってホストされるすべての関数に適用されます。Function app behaviors apply to all functions hosted by a given function app. 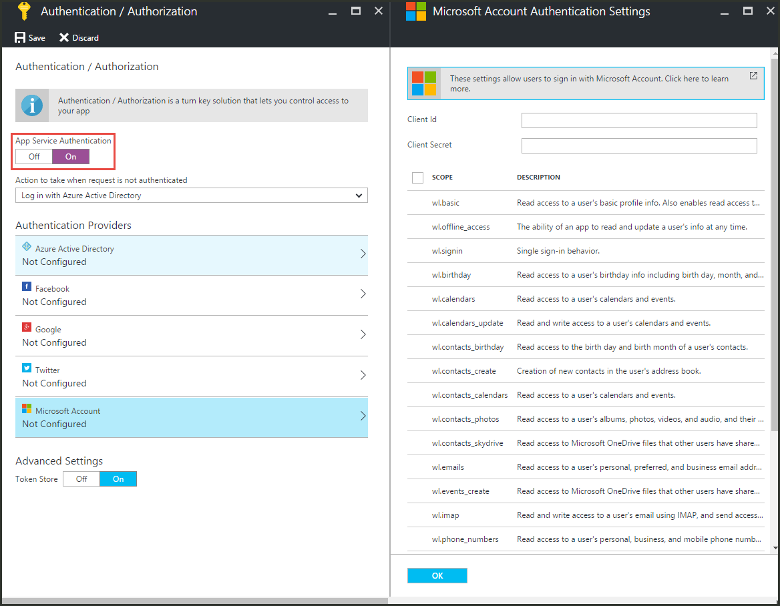 このトピックでは、Azure Portal で関数アプリを構成して管理する方法について説明します。This topic describes how to configure and manage your function apps in the Azure portal. 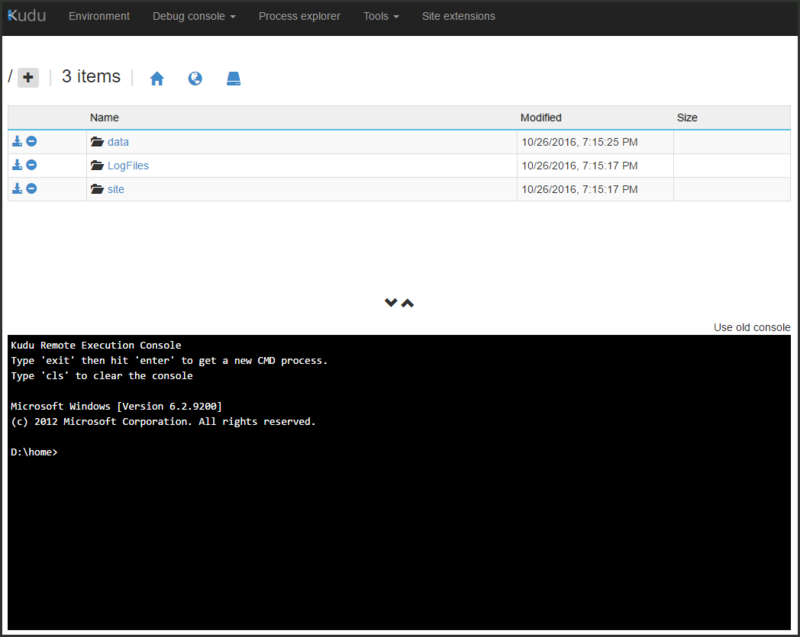 Azure Portal でリソースを見つけにくいことがあります。It can sometimes be hard to find your resources in the Azure portal. 作成した関数アプリを見つけやすくするには、ポータルでお気に入りに関数アプリを追加します。To make it easier to find the function apps you have created, add Function Apps to your favorites in the portal. 左下にある矢印をクリックしてすべてのサービスを展開して、[Filter] (フィルター) フィールドに「Functions」と入力し、[Function Apps] (Function App) の横にある星をクリックします。Click the arrow at the bottom left to expand all services, type Functions in the Filter field, and then click the star next to Function Apps. これにより、ポータルの左側のメニューに [Functions] (関数) アイコンが追加されます。This adds the Functions icon to the menu on the left of the portal. メニューを閉じ、最下部までスクロールして [Functions] (関数) アイコンを表示します。Close the menu, then scroll down to the bottom to see the Functions icon. すべての Function App の一覧を表示するには、このアイコンをクリックします。Click this icon to see a list of all your function apps. このアプリで関数を操作するには、Function App をクリックします。Click your function app to work with functions in this app. [設定] タブでは、関数アプリで使用される関数のランタイム バージョンを更新できます。The Settings tab is where you can update the Functions runtime version used by your function app. また、関数アプリでホストされるすべての関数への HTTP アクセスを制限するホスト キーを管理します。It is also where you manage the host keys used to restrict HTTP access to all functions hosted by the function app. 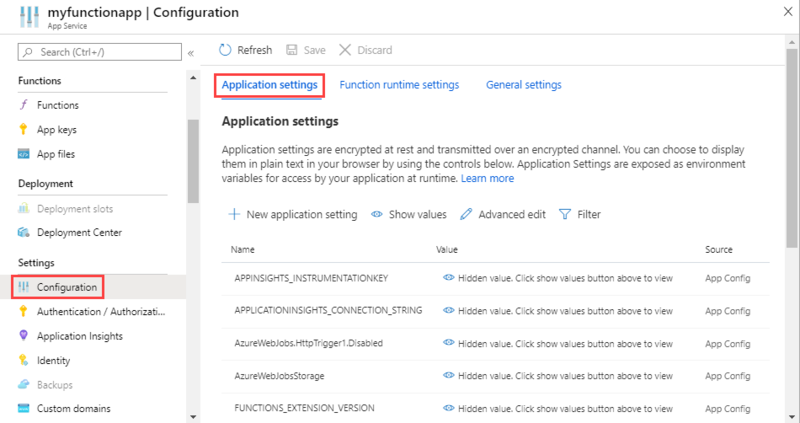 Functions では、従量課金ホスティング プランと App Service ホスティング プランの両方がサポートされます。Functions supports both Consumption hosting and App Service hosting plans. 詳細については、「Azure Functions の適切なサービス プランを選択する」を参照してください。For more information, see Choose the correct service plan for Azure Functions. 従量課金プランで予測しやすいように、Functions では、毎日の使用量クォータをギガバイト秒で設定してプラットフォームの使用量を制限できます。For better predictability in the Consumption plan, Functions lets you limit platform usage by setting a daily usage quota, in gigabytes-seconds. 毎日の使用量クォータに達すると、関数アプリは停止されます。Once the daily usage quota is reached, the function app is stopped. 使用量クォータに達した結果として停止した関数アプリは、毎日の使用量クォータの設定と同じ手順で再び有効にすることができます。A function app stopped as a result of reaching the spending quota can be re-enabled from the same context as establishing the daily spending quota. 課金の詳細については、Azure Functions の価格のページをご覧ください。See the Azure Functions pricing page for details on billing. 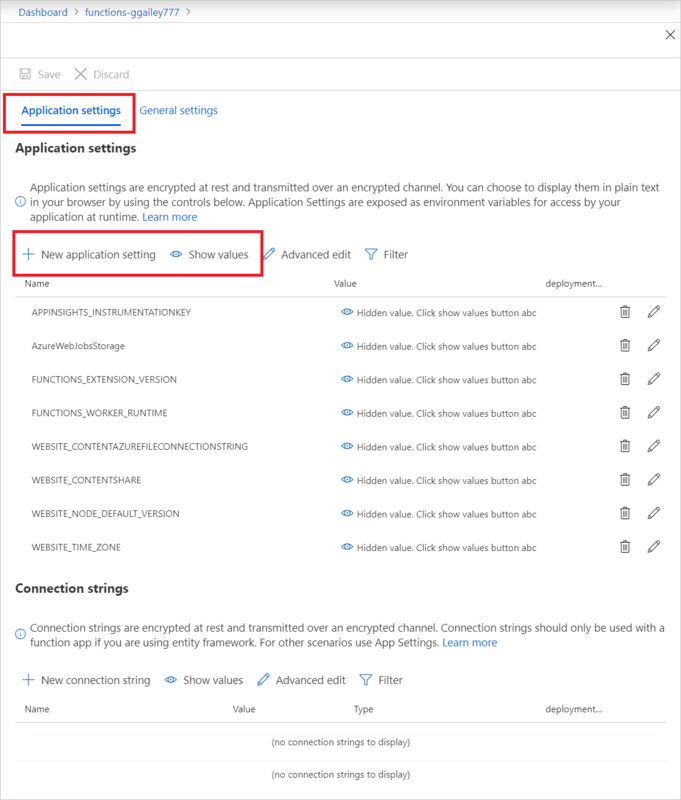 関数アプリは、Azure App Service プラットフォームで実行され、管理されます。Function apps run in, and are maintained, by the Azure App Service platform. 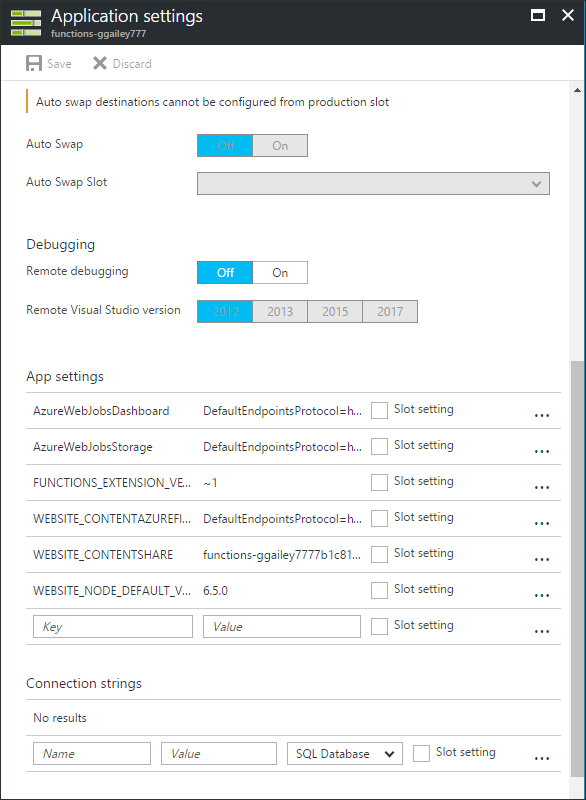 このため、Azure の主要 Web ホスティング プラットフォームのほとんどの機能にアクセスできます。As such, your function apps have access to most of the features of Azure's core web hosting platform. [プラットフォーム機能] タブでは、関数アプリで使用できる App Service プラットフォームの多くの機能にアクセスできます。The Platform features tab is where you access the many features of the App Service platform that you can use in your function apps. 関数アプリが従量課金ホスティング プランで実行されている場合は、一部の App Service 機能が使用できません。Not all App Service features are available when a function app runs on the Consumption hosting plan. 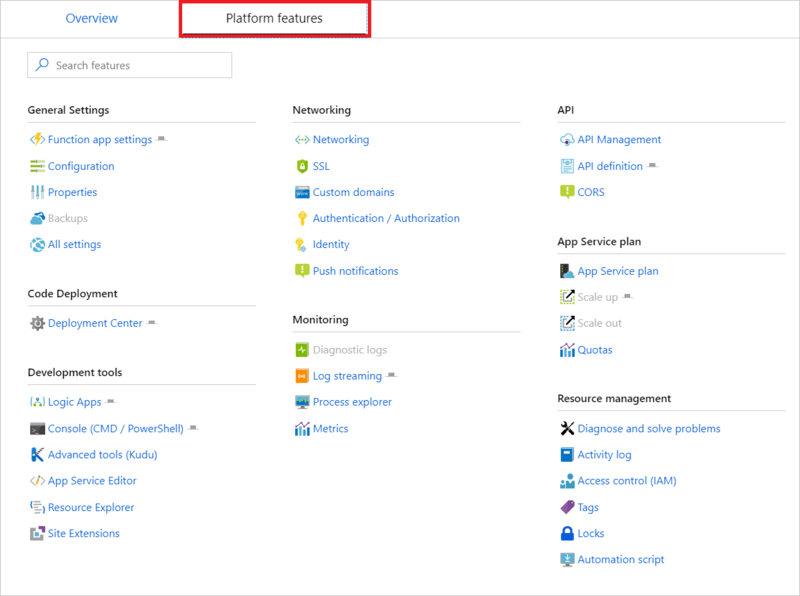 App Service の設定を使用する方法の詳細については、Azure App Service の設定の構成に関するページをご覧ください。For more information about how to work with App Service settings, see Configure Azure App Service Settings. App Service Editor は、JSON 構成ファイルとコード ファイルを変更するために使用できる高度なポータル内エディターです。The App Service editor is an advanced in-portal editor that you can use to modify JSON configuration files and code files alike. このオプションを選択すると、別のブラウザー タブが基本的なエディターで起動します。Choosing this option launches a separate browser tab with a basic editor. これにより、Git リポジトリとの統合、コードの実行とデバッグ、および関数アプリの設定変更を行うことができます。This enables you to integrate with the Git repository, run and debug code, and modify function app settings. このエディターでは、既定の関数アプリ ブレードと比較して、関数の開発環境が強化されています。This editor provides an enhanced development environment for your functions compared with the default function app blade. App Service の [アプリケーションの設定] ブレードでは、フレームワーク バージョン、リモート デバッグ、アプリ設定、および接続文字列を構成して管理します。The App Service Application settings blade is where you configure and manage framework versions, remote debugging, app settings, and connection strings. 関数アプリとその他の Azure およびサードパーティのサービスを統合する場合、その設定をここで変更できます。When you integrate your function app with other Azure and third-party services, you can modify those settings here. 設定を削除するには、右にスクロールして、行の右端にある X アイコン (下図には示されていません) を選択します。To delete a setting, scroll to the right and select the X icon at the right end of the line (not shown in the following image). ポータル内コンソールは、コマンド ラインから関数アプリを操作するのに適した開発者ツールです。The in-portal console is an ideal developer tool when you prefer to interact with your function app from the command line. 一般的なコマンドには、ディレクトリやファイルの作成、ナビゲーション、バッチ ファイルやスクリプトの実行などがあります。Common commands include directory and file creation and navigation, as well as executing batch files and scripts. 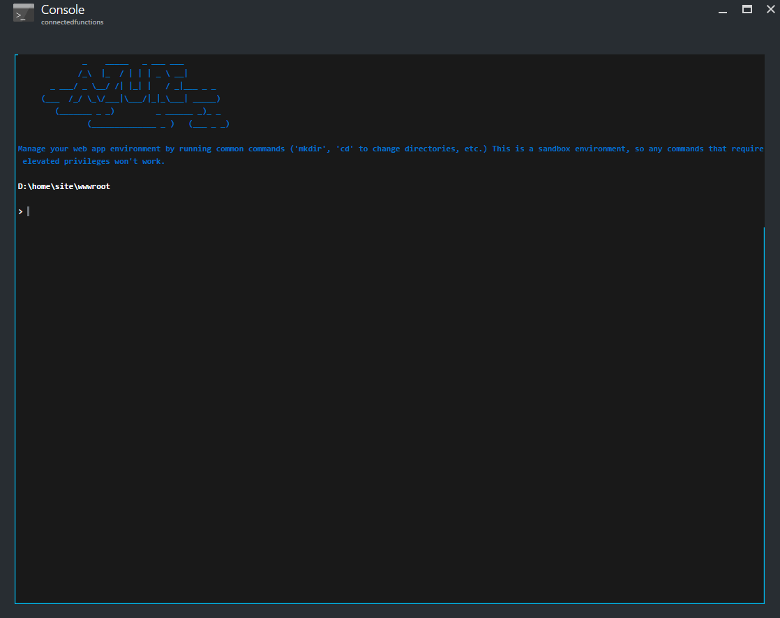 Functions を使用すると、ローカル コンピューターで関数コードを開発できます。Functions lets you develop your function code on your local machine. その後、ローカル関数アプリ プロジェクトを Azure にアップロードすることができます。You can then upload your local function app project to Azure. Functions を使用すると、従来の FTP アップロード以外に、GitHub、Azure DevOps、Dropbox、Bitbucket などの一般的な継続的インテグレーション ソリューションを使用して、関数アプリをデプロイできます。In addition to traditional FTP upload, Functions lets you deploy your function app using popular continuous integration solutions, like GitHub, Azure DevOps, Dropbox, Bitbucket, and others. 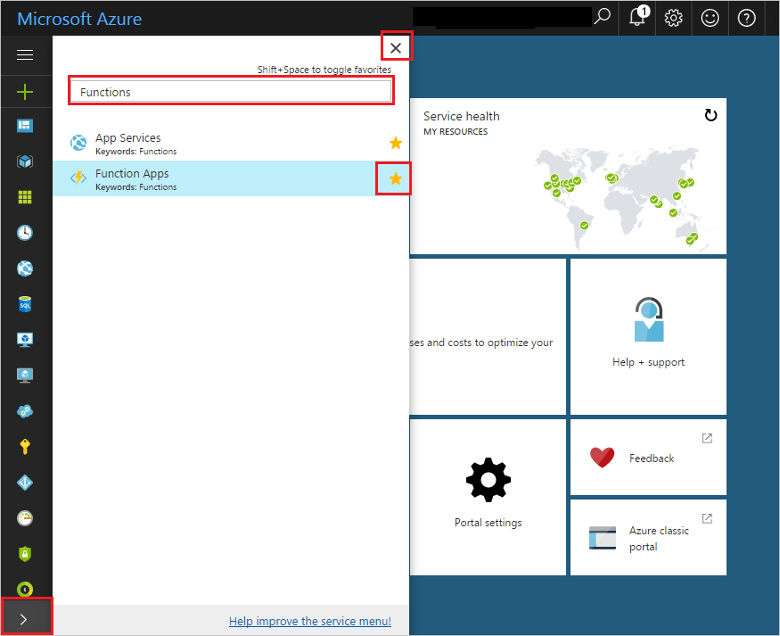 詳細については、「Azure Functions の継続的なデプロイ」を参照してください。For more information, see Continuous deployment for Azure Functions. FTP またはローカル Git を使用して手動でアップロードするには、デプロイ資格情報を構成する必要もあります。To upload manually using FTP or local Git, you also must configure your deployment credentials. 悪意のあるコードがサービスで実行されるのを防ぐために、App Service は、外部ソースから関数アプリへの呼び出しをブロックします。To prevent malicious code execution in your services, App Service blocks calls to your function apps from external sources. Functions ではクロス オリジン リソース共有 (CORS) がサポートされ、許可されたオリジンの "ホワイトリスト" を定義できます。関数が受け入れるのは、このホワイトリストに登録されたソースからのリモート要求です。Functions supports cross-origin resource sharing (CORS) to let you define a "whitelist" of allowed origins from which your functions can accept remote requests. 関数が HTTP トリガーを使用するとき、呼び出しに、最初に認証を必須とすることができます。When functions use an HTTP trigger, you can require calls to first be authenticated. App Service では、Azure Active Directory 認証と、Facebook、Microsoft、Twitter などのソーシャル プロバイダーを使用したサインインがサポートされます。App Service supports Azure Active Directory authentication and sign in with social providers, such as Facebook, Microsoft, and Twitter. 特定の認証プロバイダーの構成の詳細については、Azure App Service での認証の概要に関するページを参照してください。For details on configuring specific authentication providers, see Azure App Service authentication overview. Functions では Swagger がサポートされ、クライアントが、HTTP によってトリガーされる関数をもっと簡単に使用できます。Functions supports Swagger to allow clients to more easily consume your HTTP-triggered functions. 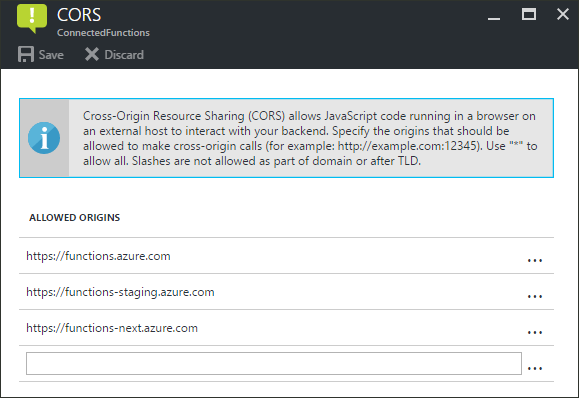 Swagger を使用した API 定義の作成の詳細については、Azure App Service での CORS を使用した RESTful API のホストに関するページをご覧ください。For more information on creating API definitions with Swagger, visit Host a RESTful API with CORS in Azure App Service. Functions Proxies を使用して、複数の関数に対して 1 つの API サーフェスを定義することをもできます。You can also use Functions Proxies to define a single API surface for multiple functions. 詳細については、「Azure Functions Proxies の操作」を参照してください。For more information, see Working with Azure Functions Proxies.